You all know what Black Friday is, but do you know what BOGOF is? No, I’m not swearing at you. It’s our..
Just order any SALE items, as normal, for every item you buy from the Specials Category we will send you one for free! So if you order 2 drumsticks we will send you 4. YOU only pay for 2! What more can I say? BOGOF? Cheers for now! Lindy & the team. 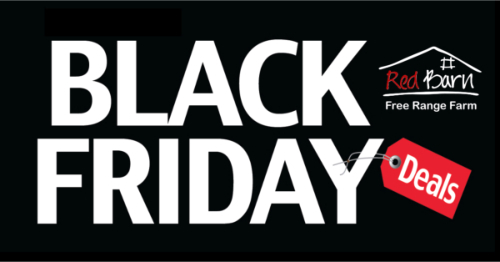 Black Friday has routinely been the busiest shopping day of the year in the United States since 2005,although news reports, which at that time were inaccurate, have described it as the busiest shopping day of the year for a much longer period of time. Similar stories resurface year upon year at this time, portraying hysteria and shortage of stock, creating a state of positive feedback. https://www.redbarn.co.za/wp-content/uploads/2018/11/black-friday-blog.jpg 262 500 Lindy https://www.redbarn.co.za/wp-content/uploads/2018/09/top-logo-red-barn-e1533460146620.png Lindy2018-11-22 06:22:062018-11-22 06:22:06Black-Friday "bogof - buy one get one FREE!"